Last week I managed to become the proud owner of two new, or rather very old, Levin guitars. With some persistence, a huge dose of luck and some money changing hands I managed to get them both here safe and I already love them. I have always been a huge fan of Hagström, also built in Sweden, but didn’t know how much I loved Levin until I figured out that my dad’s old guitar was actually a Levin. It doesn’t have any markings on it but you can read about my Levin epiphany here. The problem with old guitars is that they quite often forgot to mention the model anywhere, so you have to do a lot of detective work. Luckily for me there is an awesome guitar shop, Vintage Guitars Stockholm, that has more or less everything Levin has ever made listed on their Levin information pages. They also have some info on Hagström and the brands built by Bjärton, and the rest of the brands built by Levin: C. F. Martin & Co, Clangiton, El-Goya, Goya, Kay-Tone, Klangola, Torres, Zandelin, Nivello, Rondo. I managed to track mine down to a Levin LT-16, Levin Model 65 and the amazing Levin Model 13 Ambassadör. These Levin guitars are a bit thin sounding compared to other guitars, well I don’t have any other guitars that are 70 years old, but still. Then again they aren’t full sized so no wonder that they lack a bit of bass compared to a dreadnought, but they are very light and extremely resonant in the higher register so they are perfect for finger picking. Either way I’m super happy to have found four so old and amazing guitars that have been built in the country where I grew up, Sweden. Maybe I should add a little disclaimer here, this was originally posted back in August 2013, the Levin collection and my appreciation and understanding of the brand has grown a bit since then. Herman Carlson Levin was a young furniture maker that moved from Gothenburg to America and got a job at a guitar manufacturer in 1888. He soon started his own company in New York building instruments and while he was back visiting Sweden he realised that the demand was even higher there. He moved back home and in 1895 started Herman Carlssons Instrumentfabrik in Gothenburg. They were only five instruments makers in 1903 when they built their 1000th guitar but they soon grew bigger and bigger. The factory was one of the best in Europe and between 1904 and 1912 Levin received many awards including the gold medal in Madrid in 1907 for best guitar as well as the exhibition’s Grand Prix price. 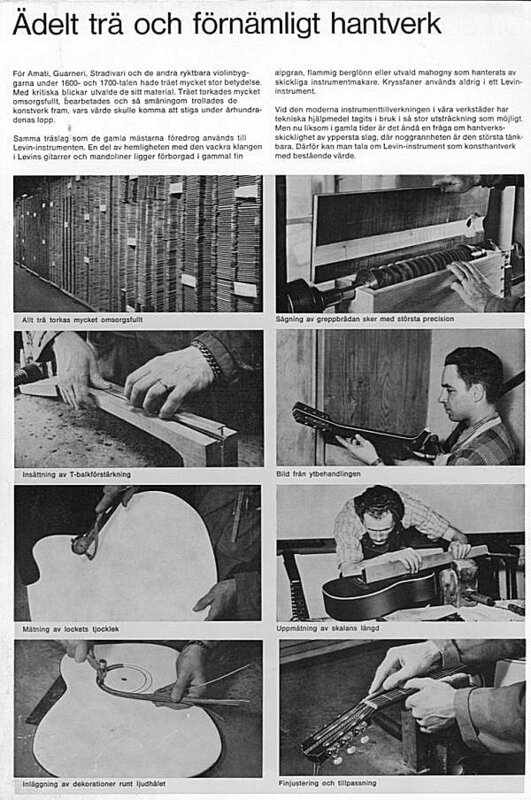 By 1936 the 100,000th instrument had left the plant and Levin was marketing a successful line of archtop guitars, like the world famous Levin De Luxe 1938. Shortly before 1940 Levin employed a crew of 45 in facility of a 1000 m². In the 1950s, Levin launched a line of inexpensive guitars intended for schools and novice guitar players. These guitars were of lower quality than the rest of the Levin line up. 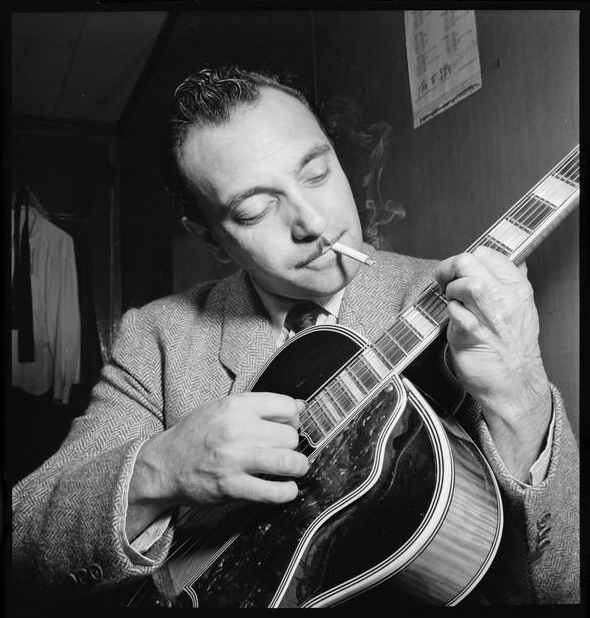 In 1952 Jerome Hershman a guitar distributor from America noticed Levin guitars at a trade show in Germany and convinced the Levin company to let him market their guitars in America under the name Goya, Levin apparently sounded too Jewish. He also got Hagström to make some fine electric guitars for the US market as well. These nylon stringed Levin / Goya guitars got quite popular in the late 1950’s and especially with the folk singers in the 1960’s when they started to produce steel stringed guitars on a typical nylon stringed body. When Goya was sold in 1968 the Goya export was approximately 70% of Levin’s total production. They had a huge contract with Goya that they lost in this sale, something that took really hard on Levin and they had to close down the second factory they opened in Lessebo and let half of its work force go. A lot of companies got bought and sold over the next few years, Kustom bought Goya, Dude bought Kustom and in the end C. F. Martin & Co bought them all. 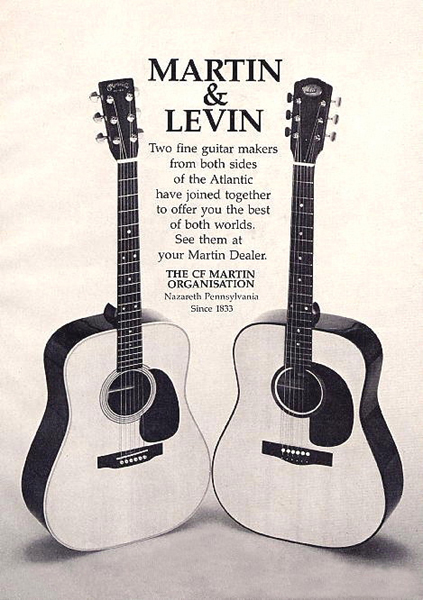 In 1973 when Martin bought Levin, it became the headquarters for Martin Guitars and their Japan import brand Sigma Guitars in Europe, as well as actually producing a run of some 200 Martin D-18 acoustic guitars, which were labelled “LD-18 – Made In Gothenburg, Sweden. These are quite rare and expensive today. The last “real” Levin built in Sweden left the factory in 1979, they are still building nylon stringed Levin guitar in Sweden to this day. In 1982 Svensk Musik AB bought the name Levin and the remaining stock from C. F. Martin & Co and in 2000 they changed their name to Svenska Levin AB. They are now producing steel stringed guitars in the far east and have a small batch of nylon stringed guitars being built in Sweden. Here is the whole story about Levin together with some amazing photos, Levin History. Hootenanny Singers sure liked their Levin guitars. Björn Ulvaeus, the guy on the far right got a bit famous later on with his next band, ABBA. Levin was pretty much the main brand for acoustic instruments in Sweden back in the days. We also had Bjärton but they mainly made nylon stringed guitars and of course Hagström but they were more famous for their electric instruments, even though they built some really nice acoustic guitars together with Bjärton like the legendary Hagström J-45. I’m not sure if it was the handsome chap to the left that built my Levin Model 13 Ambassadör. 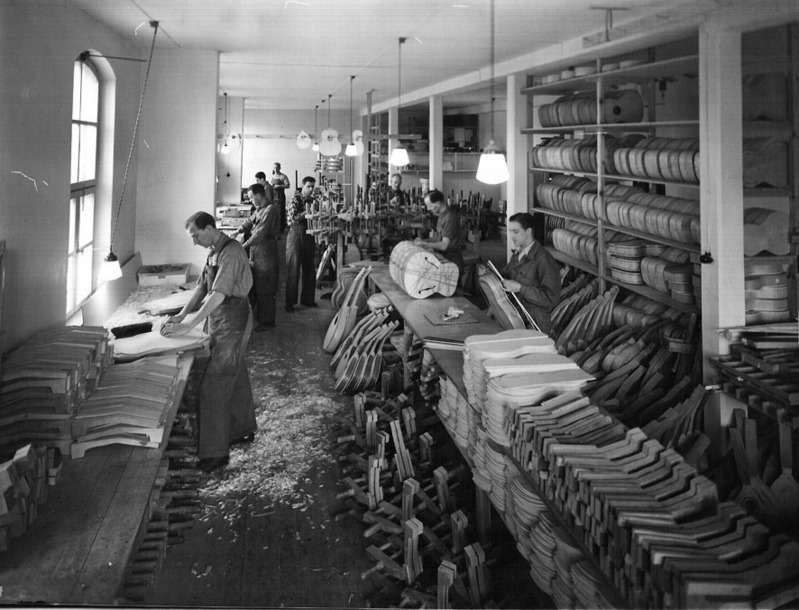 The Levin guitar factory on Kvillegatan 9 in Gothenburg in the late 1940’s. Hi im Orla Steffens from Denmark. You say that you would like to find a Levin, Model 174 like the one on your picture right ? Well let me know if you are still looking for it … because … i have that guitar and it is for sale !!! The reason for me to sell it is that i cant play on a guitar at all. It’s nice to see someone else with as high an opinion of Levin/Goya guitars as I have. My first guitar was a Goya M-26 (the same guitar as the Levin LM-26 with a different brand) that I bought used in 1960. It developed action problems and I sold it a few years later, but I always regretted it. About 15 years ago a friend told me about an M-26 in Toronto and, after getting my wife’s approval, I drove to Toronto and bought my 1058 M-26. It needed a neck set, but, due to the bolt on neck, it was reasonably priced. The Goya is my least expensive guitar, but it gets as much playing time as the more expensive ones. What year did they start putting the position markers on the bass side of the fingerboard? That should be 1958 M-26, not 1058.